Britain's Jon Schofield won K1 kayak 500m sprint gold at the European Wild Water Championships in Bosnia. The Lancashire 22-year-old, who posted the two fastest times of the event, said: "I have been working towards this moment since I started paddling." First-year senior Jessica Oughton from Leicester won women's K1 sprint bronze, missing out on silver by 0.01 seconds. In the Hungary round of the Flatwater World Cup, Tim Brabants of Walton on Thames paddled to K1 1000m bronze. It was his second third-place finish in this year's World Cup series. Canada's Olympic champion Adam Van Koeverden won in 3.27.6, with Zoltan Benko of Hungary (3.38.3) in second, followed by Brabants (3.28.8). 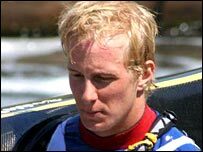 Brabants won GB's first ever Olympic canoeing medal at the 2000 Sydney Games and was European champion in 2006. The European Flatwater Championships take place from 28 June-1 July in Spain.